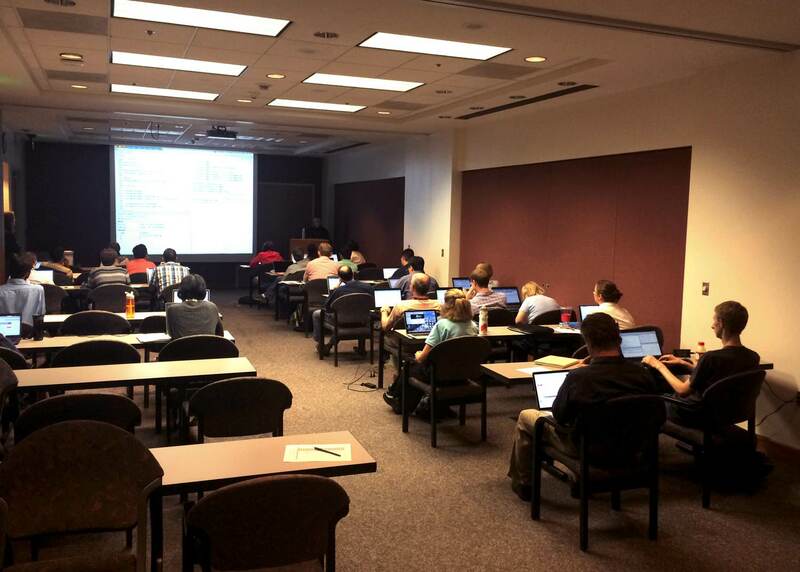 Last week I taught a three-hour introduction to R workshop for life scientists at UVA's Health Sciences Library. In the first half hour or so I presented slides giving an overview of R and why R is so awesome. During this session I emphasized reproducible research and gave a demonstration of using knitr + rmarkdown in RStudio to produce a PDF that can easily be recompiled when data updates. In the second (longest) section, participants had their laptops out with RStudio open coding along with me as I gave an introduction to R data types, functions, getting help, data frames, subsetting, and plotting. Participants were challenged with an exercise requiring them to create a scatter plot using a subset of the built-in mtcars dataset. We concluded with an analysis of RNA-seq data using the DESeq2 package. We started with a count matrix and a metadata file (the modENCODE pasilla knockout data packaged with DESeq2), imported the data into a DESeqDataSet object, ran the DESeq pipeline, extracted results, and did some basic visualization (MA-plots, PCA, volcano plots, etc). A future day-long course will cover RNA-seq in more detail (intro UNIX, alignment, & quantitation in the morning; intro R, QC, and differential expression analysis in the afternoon). I wrote the course materials using knitr, rendered using Jekyll, hosted as a GitHub project page. The rendered course materials can be found at the link below, and the source is on GitHub. A colleague and I just (yesterday) delivered a similar workshop, in a similar format. Ours is at https://github.com/wall0159/R-workshop, though I haven't put the powerpoint slides in yet, I will. I might try and merge some of your content into ours too, when I've time -- I'll let you know if I do. Thanks for sharing this!